Soldier's Letter, 3 pages, 8vo., Camp Graham, Sept. 21st, 1861. 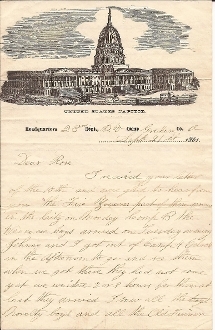 Charles F. Huber (Co. A, 23rd Pennsylvania Infantry; later in Co. F, 82nd Pennsylvania Infantry) writes on United States Capitol, HeadQuarters Twenty-Third Regt., P.V., Co. A patriotic stationery. Col. Dare was up for Brig. General was he not. I heard that was and got defeated...".